Johnnyhilldo: Canada's First Gold Medal on Home Soil! Here's another Olympic and non poker post, but history was set here at Cypress Mountain in Vancouver today. 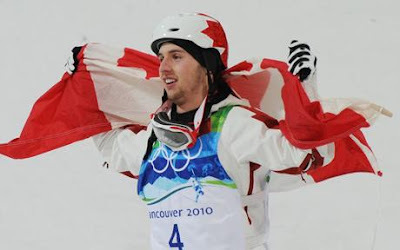 34 years and 500 athletes later, Alexandre Bilodeau has won Canada's first Gold Medal on Canadian soil during his run in the Men's Moguls today! A nice relief for all Canadians as it has happened within the first 48 hours of the games. Jennifer Heil was the favourite to get Canada's first Gold during the Women's Moguls, but came up just short taking the Silver. USA's Hannah Kearney won the Gold and had a spectacular Mogul run. This no doubtingly will spark the Canadian Athletes and there will be plenty more Gold Medals awarded to Canadians during this Olympics. You can read about it here if you like Alexandre Bilodeau.